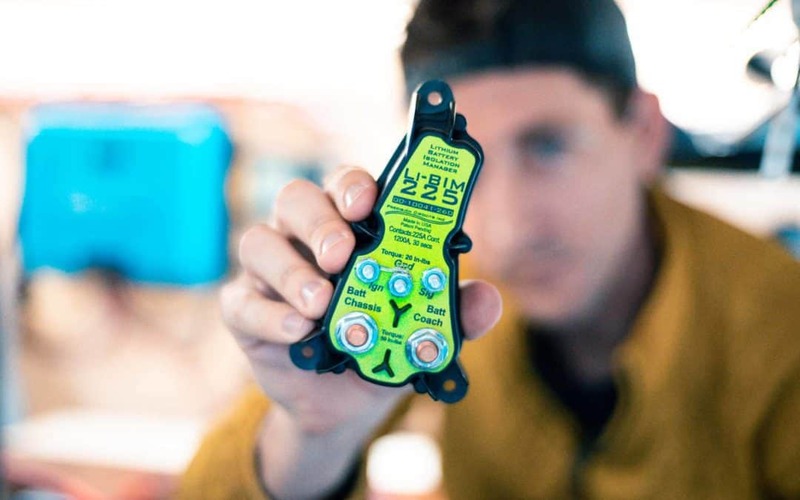 A Battery Isolator combines the ‘house' battery bank that runs your lights, fans, refrigerator, computers and such to your starting battery so it can be charged by your vehicles alternator. Most Battery isolators are rated in terms of amps. This number is simply the amount of potential amps that could be flowing through the device from your alternator to your house battery bank. Your battery isolator will depend on the size of your alternator. Although you'll likely never see your full alternator output amperage going through your isolator, it's really the only base line you've got. Size your battery isolator to handle the max amp output from your alternator. The max amps your alternator will output can sometimes be found in the spec sheet of the vehicle. If you don't have this or can't find it. It will typically be stamped onto a metal plate on the alternator itself. Due to the resting voltage rates of Lithium Batteries, you'll likely want a lithium battery specific Isolator. 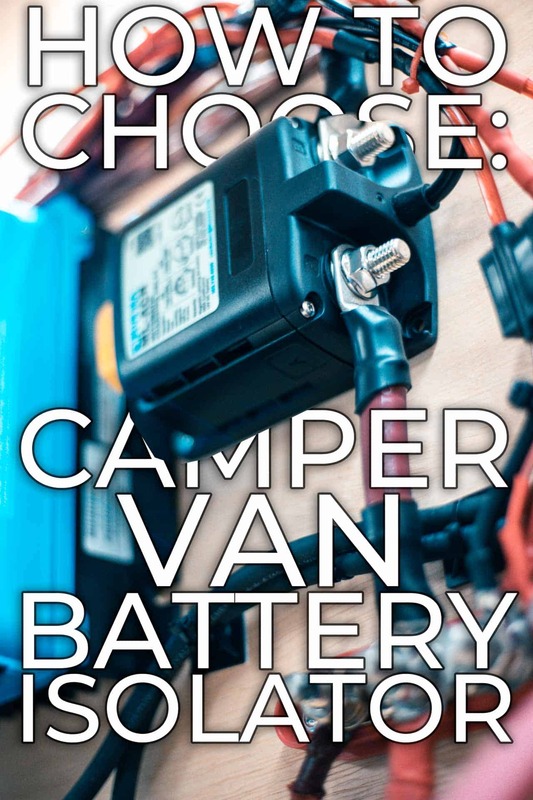 Although a normal battery isolator shouldn't ‘damage' your lithium batteries, it simply may not disconnect properly when your engine is off as it may see the higher voltage of the lithium batteries as ‘charging', which will keep the batteries combined. Blanket Statement: Use 2/0 wire. 2/0 wire will be enough for 95% of applications. 2/0 wire with 105°C insulation under 50 feet in length is capable of handling currents of up to 330 amps. Most applications will never see amps that high nor are most alternators capable of putting out that many amps. With 2/0 wire, as long as the house battery bank is kept within 12 feet of the starting battery, even at charging rates up to 149 amps, a 3% voltage drop will still be achieved. I wanted to gather some real-world data from those who were charging their house batteries with their alternator. More specifically, I wanted to find out what the max amps people have ever seen going from their alternator to their batteries. So, what did I do? I reached out to various camper van facebook groups, THE home of Questionablly Reliable Crowd-Sourced Data. There were also some respondants who didn't know how many amps they were charging their house batteries with, BUT they did know the fuse size that was on that wire from the alternator to the house battery, which we can then assume that their amps never go above the size of that fuse. What conclusions can we draw from this info? Not much, honestly… The biggest takeaway that I can gather from this information is that house battery banks charged by the alternator rarely charge at rates greater than 100 amps. This sample size is small enough, though, and stats are questionable enough to need to disclaimer that this info should only be used as an “FYI” rather than actual good information. This does back-up even further, though, my claim that 2/0 is a great choice of wire size for installing a battery isolator. If you go this route, keep in mind your voltage drop. Or just use 2/0 and call it good. For the ACTUAL detailed installation instructions, you will need to reference the installation documentation in whatever isolator you decide to install. How do I know the size of my alternator? 2014 Ram ProMaster Front Wheel Drive 20 feet long 6 feet wide and 8 1/2 feet tall…….. I know nothing about engines other than they start when I turn the key. The van moves forward when I shift to the D…. The max amps your alternator will output can sometimes be found in the spec sheet of the vehicle. If you don’t have this or can’t find it. It will typically be stamped onto a metal plate on the alternator itself. Hey, Nate, well, My alternator is on it’s last legs and is being replaced Monday! I I asked and it’s 220Amps. Assuming the people you asked about alternator size have Sprinters and Promasters, I’m amazed at the range of alternator sizes of your respondents. I was wondering if you have an idea of how many amps at 12v you get from the Li-BIM per hour while driving on the hwy. Reason I ask is BattleBorn also sells the Sterling battery to battery charger which tells you exactly amp output, however the Li-BIM cycles so it is hard to tell. The Sterling also has ability to be turned on and off, and some programing flexibility. Can the Li-BIM be turned on and off, and also will it work with a 24 system? Appreciate your help! Nate I have installed your Explorist.life system in my camper. Thank you so much for your DIY system. Every thing was plain, simple, and easy to follow. I only have a couple of things that are a bit puzzling. 1- the operating of the current limit dial on the Digital multi controller. 2- The Battery isolater LI-BIM 225. I hooked it up as specified in your drawing. Did not add a manual switch. I ran my batteries down to 83% then hooked it to the Truck to test for charging. I tested all wires with a 12v tester and all were hot after starting the truck. However no charge was coming in to the charge controller. I have researched this for a few hrs. know and recall at one point read on one of thees that they will not start charging until the battery’s are below 80%, Is this correct? Also I swapped the Ignition wire which was hot at the time to the switch position and the controller indicated that it was charging at 225. Do I need to ad a manual switch if I want to charge when the batteries are above 83%? and will it be possible to over charge with a manual switch. Also on your DIY diagram the manual switch is hooked to the +pos side. But on the precision circuit sight I think it indicates that the sig (manual switch) is hooked to a ground? I would like to figure this out as My wife are going on a 4 mo. off grid trip up the Great divide mountain bike route with a horse and wagon. Starting the 2nd of May. That is for limiting the current through the multiplus powerassist when connected to shore power. I’d recommend setting it to 30. Yep! That force combined the batteries. Do I need to ad a manual switch if I want to charge when the batteries are above 83%? and will it be possible to over charge with a manual switch. I’d contact Battle Born for clarification on that, but your Battle Born batteries have high voltage protection built into their BMS to negate that. Also on your DIY diagram the manual switch is hooked to the +pos side. But on the precision circuit sight I think it indicates that the sig (manual switch) is hooked to a ground? That, apparently, can go either way. I’m working on some more documentation on all of this because the documentation that’s available is… a bit underwhelming. Stay tuned.